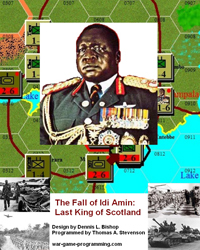 The Last King of Scotland, a low complexity operational level simulation of the fighting between Uganda and her Tanzanian neighbor in 1978 and 1979 which ultimately sent Amin fleeing Uganda and left in its wake a bloody civil war. Fall of Idi Amin covers the entire area of the conflict which matched a small professional army against a large militia army in a war where supplies were often the key to victory. Orders of Battle include PLA guerrillas, Libyan tanks, artillery, and infantry, UNITA guerrillas, and specialized units like the Tanzanian engineers and Ugandan Malire Regiment. Thomas Clawson 5 5 5 any way to put in as a board game?